Our fluorescent signs offer a bold and easily noticeable form of advertising. These signs have a black background and fluorescent yellow, fluorescent pink and white letters which stand out giving your message immediate attention to onlookers. 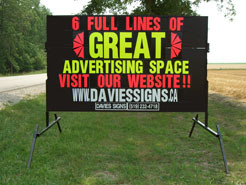 We have 6’ x 8’ or 6’ x 10’ fluorescent signs available. Our fluorescent yellow and pink letters have a deeper and richer colour than many other fluorescent letters in the sign industry. 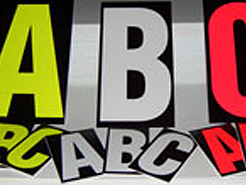 We ensure your message looks the best by using bright new-looking letters instead of faded ones. 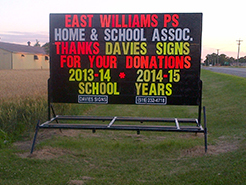 Don’t just take our word for it, look at any of our signs when you’re out driving around! Our delivery personnel are friendly and willing to work with you to find the best location for your sign. Our fluorescent signs come delivered with your message on the sign, so you don’t have to bother with the lettering. For pricing, give us a call.